Home / Field Geeks / Baseball / Who Are The Top Ten MLB Starting Pitchers Today? Who Are The Top Ten MLB Starting Pitchers Today? So, with the season coming to an end, it’s time to look ahead to the upcoming off-season. To do that, we’re going to break down the top 10 players at each position over the next several weeks. I started with the position I played my whole life- the catchers. Now, I will give the pitchers some love with the top ten starting pitchers. With this list, I go by the “what have you done for me lately”, which can include how consistent a pitcher has been the last five years or so. The starting pitchers are now in a new kind of era because of numbers, innings, and pitch counts. Here, as expertly ranked by the CBSSports.com scribes, are the 10 best starting pitchers in baseball for the 2017 off-season and I will start with number 1 all the way down to the 10th. The list was easy when it came to the first five on the list. But, the last five took me a long time to figure out, which is why the article ends in that way. This was a breakout season for Robby Ray, pushing the D-Backs into the post-season for the first time since 2011 and in my mind, the ace of the staff. Even though this was a breakout kind of year for Ray, I believe he will only get better and better. This season, D-backs left-hander Robbie Ray finished the 2017 regular season with a 15-5 record, a 2.89 ERA, a 1.15 WHIP and 218 strikeouts across 162 innings. The D-Backs will be around for a long time if this lefty stays healthy and continues to develop. All we can look to now is to see if Ray can improve next season from this great season. 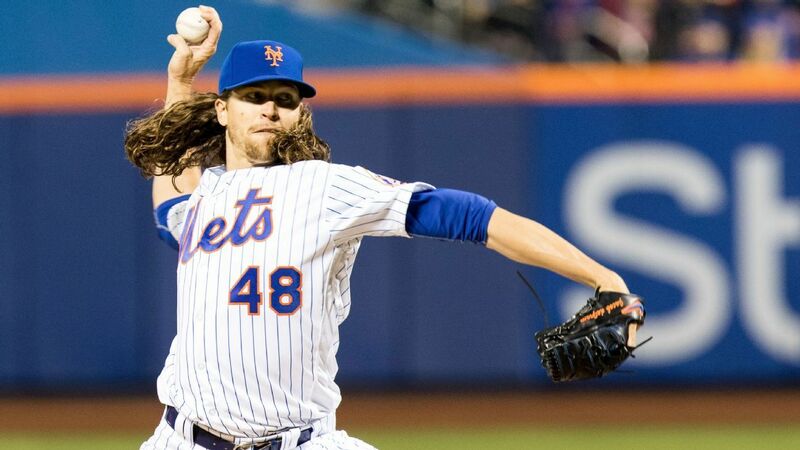 In his time with the Mets, Jacob deGrom has never been named the Opening Day starter. Those around him seem to steal the spotlight, but when the season comes to an end, deGrom’s body of work speaks for itself. deGrom was the unquestioned ace of this staff in a season, partly by default, but even if all the starters remained healthy, the lanky righty ranked among the best in the league. He reached the 200-inning plateau and ended the season with a 15-10 record. He finished 10th in the league in ERA and was second in total strikeouts behind only Max Scherzer. In fact, he notched eleven double-digit strikeout games, and he added his name to a bit of Mets history by picking up over 200 strikeouts. He joined Tom Seaver, Dwight Gooden, and David Cone as the only Mets to have multiple 200-strikeout seasons, and his 239 total placed him ninth in Mets’ history for most strikeouts in a single season. His 2017 10.68 K/9 rate ranks second on the Mets’ leaderboard behind Dwight Gooden’s mark of 11.39 K/9 in 1984. Velocity was a concern for deGrom throughout the 2016 season, but he had no such issues this year, which could be a reason for high strikeout rates. In fact, he finished the season on an upswing in velocity which is promising for the team going forward. Steven Strasburg, another raw talent in the game today. Strasburg finished the 2017 season (W, 15-4), 2.52 ERA, 2.71 FIP, 47 BB (2.14 BB/9), 204 Ks (10.47 K/9), 28 GS, 175 1/3 IP. A solid number two behind Max Scherzer, has now officially considered being in the top ten in all of baseball. We’ve been waiting for a long time for this pitcher to be one of the top in the game. Injuries have but that to a halt but now that Strasburg had a season to remember and the pressure going on the shoulders of Scherzer, Strasburg can be considered not only in the top then, but maybe the top number two starter for any team. Steven Strasburg can easily be a number one on any other team. If this guy is not healthy, the Nationals do not make the playoffs. On raw talent alone, Syndergaard might top this list. He led all starters with a 98.2-mph average fastball velocity, topping the next name on the list by well over a full mph, and even though his debut in 2015 was impressive, his follow-up in ’16 was better. Syndergaard increased his strikeout rate, held his walk rate steady and sliced his home-run rate in half. There’s even evidence, according to FanGraphs, that the Mets’ outfield defense made him look worse than he should have been, and he looked great anyway. Just about the only knock against Syndergaard is that he had forearm tightness in 2015 and elbow spurs in ’16, which has to add some amount of risk to a pitcher who already throws harder than anyone. When healthy, Syndergaard can be in the top 3, easily. It was easy to forget about Darvish, given the Tommy John surgery that erased his 2015 season and delayed his ’16 debut, but when he returned last summer, he was absolutely fantastic. In 100 1/3 innings following his return, his strikeout rate of 31.7 percent was a career-best and essentially the same as Scherzer’s. Darvish sliced his walk rate to a career-low 7.5 percent — which is interesting, as command is usually the last thing to return after surgery — and he did it while relying more on his high-spin fastball, as recommended by catcher Jonathan Lucroy. His 100 innings is enough to show his arm is healthy, and he’s never been less than dominant in the big leagues. Darvish expects to get a big pay day this off-season. After years of heavy use and success, Verlander was nearing the edge of being written off after two subpar (for him) seasons in 2014 in ’15, beset by surgery and declining velocity. But he quietly showed enough late in 2015 that he seemed like a good comeback candidate, and he did that and then some, throwing 227 2/3 innings with the highest strikeout rate (28.1 percent) of his career. No starting pitcher had a higher spin rate on his fastball than Verlander, and since he began using it more effectively, it became his best pitch. This wasn’t quite vintage MVP Verlander, but it was close. Verlander is back to being one of the best since joining the Astros. If Kluber’s postseason heroics were his national coming-out party, then you’re about three years behind the times. The 2014 AL Cy Young Award winner continues to pump out 200-plus innings of dominance a year, to the point that, by some measures, 2016 was his least impressive year, and it was still outstanding. There’s a good argument to make that Kluber’s curve/slider — he simply calls it “a breaking ball” — is the best pitch that any starter owns, according to FanGraphs. If the only thing on his resume was the lack of postseason credentials, he has that now, too. Kluber has a very impressive season but failed to complete the season in the post-season. While there’s a clear top three in this list-maker’s opinion, you could probably order everyone else in just about any fashion you wanted. We’re going with Sale at No. 3 because he’s had five straight seasons of elite performance and health, allaying just about any concerns that his funky delivery wouldn’t allow him to hold up over time, and because there’s evidence that the move to Boston could help him considerably. As we wrote at the time of the trade, Sale was hurt by poor pitch framing more than just about any other pitcher in 2016. The departure of plus framer Tyler Flowers isn’t the only reason Sale’s strikeout rate dropped from 32.1 percent in 2015 to 25.7 in ’16, but it matters — a lot. He got more help in Boston, both behind the plate and in the field. I believe Sale should win the AL CY Young this season. Scherzer did just about everything he could to overtake Kershaw, topping 210 innings for the fourth season in a row, easily winning his second Cy Young Award, and tying a record by striking out 20 hitters in a game. Scherzer’s 31.5-percent strikeout rate wasn’t only a career high, it was the highest by any starting pitcher with 150 innings pitched other than Fernandez, and Scherzer kept his walk rate low. While there was a minor home run issue that led to a higher-than-expected ERA, Scherzer’s sheer dominance over so many innings makes him a very worthy No. 2 on this list. For Scherzer to get to number one, he needs to perform in the post season. Yes, Kershaw missed two months with a back injury, which likely cost him a fourth National League CY Young Award in six years. No, it doesn’t matter. Kershaw was already on a Hall of Fame trajectory entering 2016, and all he did was deliver his most dominant season yet, doing insane things like putting up a 172/11 strikeout-to-walk ratio(!) in 149 innings with a 1.69 ERA. You can offer all the lame “but playoffs” jokes you want, forgetting that he managed to dominate the Cubs in Game 2 of the NL Championship Series, and he’s still the best pitcher in baseball. This one’s not close.